OK, I found something to write about! I get an email from the local theatre each week that tells me what's showing. 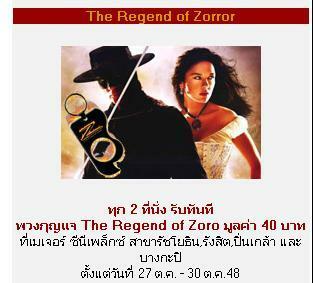 This week, you can go see "The Regend of Zorror". I'm sure it will prove to be a great flick. I'll probably just pick up a copy on DVD at the night market for a buck or two. It will probably be "filmed" right in one of the local theaters with people moving in front of the camera.